The Director General of Military Operations (DGMO) is the most important appointment in the Indian Army and amongst the most important in the government as a whole. He is custodian and executor of the operational plans of the country. Even within the Tri-services milieu, he can be considered as Primus Inter Pares – the Airforce and Navy both have his counterparts in Air Operations and Naval Operations, but the DGMO heads Military and not Army Operations. A nuance that reflects the traditional primacy of the ground arm of the forces due to size and nature of operations so far. One of the better known aspects of his role is the fact that he and his counterpart in Pakistan have a direct hotline, used for a routine weekly talk and on special occasions to avoid unplanned escalations due to ‘noise’ in flow of information. 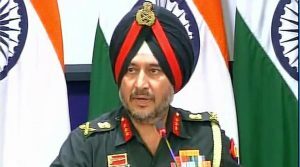 On 29th September, Lt Gen Ranbir Singh, the present incumbent, picked up the hotline and spoke to Maj Gen Sahir Shamshad Mirza, his Pakistani counterpart, to inform him of Indian Army’s operations against terrorist launch-pads across the Line of Control in POK. Shortly afterwards, he addressed a press conference to give out the details of the operations to the media and through them, the nation. The operation, ever since being referred to as ‘surgical strikes’, has since generated varied reactions within the country and across the world. From complete denial, as expected, by Pakistan, to varying degrees of approval, support and disbelief from across the world. The overwhelming response within the country has been one of pride and jubilation. Not because violence of any kind is a cause for celebration – but the people of this country had become accustomed to news of terrorist attack after another with no apparent response from our side except ‘strongly worded statements’. There is only so much beating people’s pride can take. In the Bollywood movie ‘A Wednesday’ a middle aged common man, played by Naseeruddin Shah, hatches a devious plot to ensure just retribution to some notorious terrorists. He succeeds, and goes back to his ordinary life without ever being discovered. The immense popularity of the movie reflected the sentiment of majority of the people who were hungry for such revenge. And coincidentally, it was a Wednesday when the country did finally get its retribution. It was no wonder that in the face of such overwhelming public approval for the action, all opposition parties expressed strong support for the government and army. Not only would it be extremely churlish to do otherwise, it would also be extremely damaging politically. Yet, in the low brow world of Indian politics, such uncharacteristic civility has a short shelf life. It hasn’t taken various opposition parties to climb down from the bonhomie in the flush of immediate aftermath of the operations, and initiate murmurs of disbelief while also trying to play down the significance of the operations. The first, initiated by Delhi Chief Minister Arvind Kejriwal in his typical sly and indirect manner, was the demand to release the footage of the operations as proof to the doubting Thomases in “Pakistan and international media”. It was school-boyish ploy (Teacher, I’m a good boy but he’s asking… can you answer him?) aimed at being politically correct and remaining on the right side of popular sentiment while trying to simultaneously plant doubts about the government in their mind. The thread was taken up by Sanjay Nirupam, an ex Shiv Sena and current Congress member and former MP, albeit in stronger language. Politics apart, such voices are truly inimical to the country’s interests. The fact that both these statements have since been played up in Pakistani media as evidence that the strikes never took place is ample indicator of this. It’s not clear whether the two ‘leaders’ in question don’t really understand the issues involved, or whether they do but disregard them in the hope of political advantage. Possibly they don’t know the difference between a military operation and a sting operation – something that they’re definitely more familiar with. Hence the demand to release the video footage to ‘prove’ the claims. Do they even realize that such footage, if released, has the potential of giving away critical operational and tactical information to the enemy, which could jeopardize similar operations in the future? Why should Indian Army provide readymade training videos to their own enemies – showing them the mistakes they made, and what to look out for in the future? If at all the army clears the release of any footage, it will have to be after detailed analysis and editing to avoid giving away any such information. And any edited footage would be open to question of being doctored. So, if the DGMO’s word isn’t good enough for these leaders, they should be allowed to remain in their skeptical world without any further attention being paid to them. The other narrative being built up now is ‘This isn’t the first time such strikes have taken place.’ The Congress has given out dates on which similar operations were carried out under their regime. The difference, they say, was that they weren’t publicized. Fair enough. It’s for the army to do its job as per political direction and clearances, and for the government to decide what information to make public. This would depend on its policy and strategic imperatives, which are dynamic due to external and internal factors. And it’s an incumbent government’s prerogative whether to follow in the footsteps of its predecessors or blaze a new trail. And in doing the latter, if the past governments look weak and indecisive in retrospect, so be it. Since the last word on this is far from having been said, we will witness many more twists and turns in the days to come. It would be prudent for the opposition to weigh their options and words carefully for two reasons. First, of course, it’s national security which is in question. And second, which should be of greater interest to them, in what seems to be an attempt to prevent the government from getting political mileage from military actions, they shouldn’t end up harming themselves irreparably.